This page has step-by-step instructions for the construction of a Zome model of a projection of the regular polychoron commonly referred to as the "600-cell". It is assumed that the user is familiar with the basic terminology surrounding the Zome system. 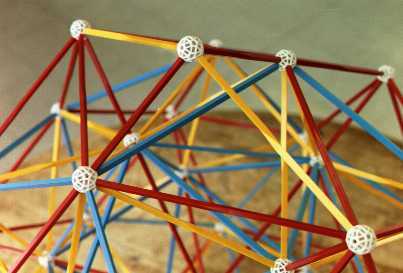 One can find an outline of these terms in the most current Zome Manual or the Glossary at the Zometool website. The model constructed on this page is the "large" version. 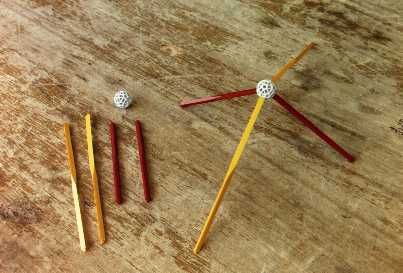 Using commonly available parts, one can also build a "small" version of the model. 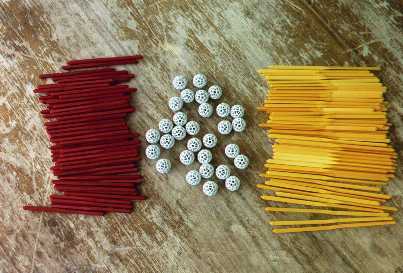 One accomplishes this by using the shorter versions of all the pieces used here. Thus, one may use B2 struts in place of B3 struts, R1 struts in place of R2 struts, and so on. With four or more people working on it, the construction time is less than an hour. Inventory. 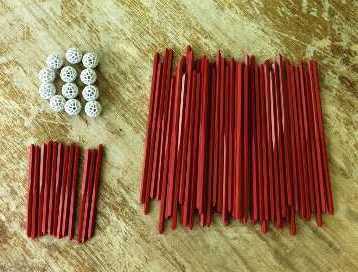 In order to build this model, you must have 75 balls, 72 R2 struts, 72 R3 struts, 120 B3 struts, and 120 Y3 struts. Stage I. 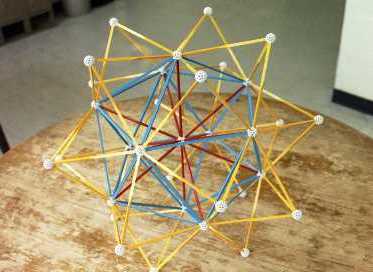 The core of the model is an assembly of 20 tetrahedra. 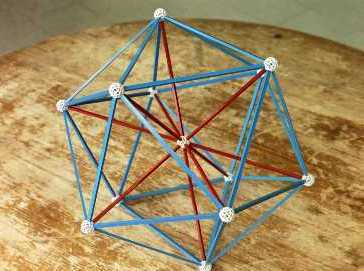 This is a regular icosahedron, with blue edges, with each vertex adjoined to a central ball by a red edge. 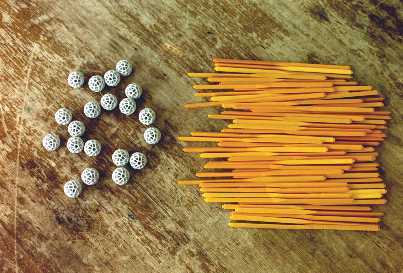 This requires 1+12=13 balls, 12 R3 struts, and 30 B3 struts. 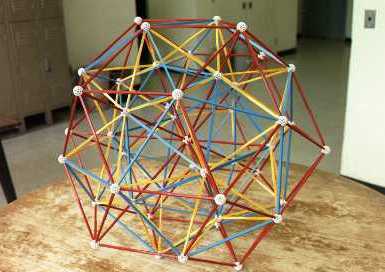 Here is one of the central tetrahedra. 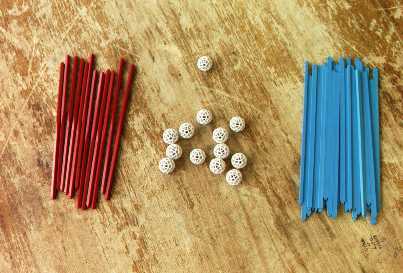 Continue to add red struts, blue struts, and balls. This is how the model appears when stage I is completed. Stage II. In this stage, you must adjoin a layer of 20 tetrahedra to those already present. This requires 60 Y3 struts and 20 balls. 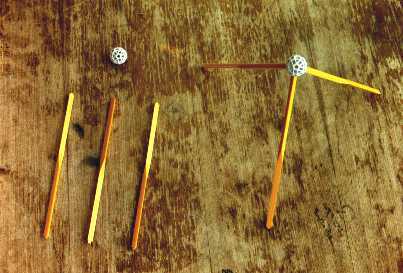 With 3 yellow struts and one ball, build a trihedral spike as shown. You need a total of 20 of these. Mount a trihedral spike on one of the blue triangles which appeared in Stage I. Mount the remaining trihedral spikes. This is how the model appears after stage II is completed. Stage III. The next step is to adjoin a layer of 30 tetrahedra. Nearly all of the edges of these tetrahedra are already present, so one merely has to complete them by adjoining 30 B3 struts. Here is a detail of how one of the blue struts is attached. 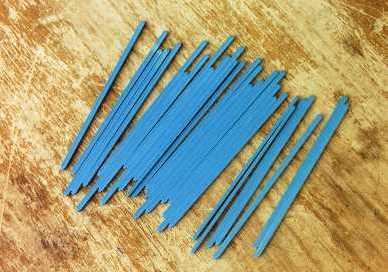 Attach the remaining blue struts. This is how the model appears when stage III is completed. 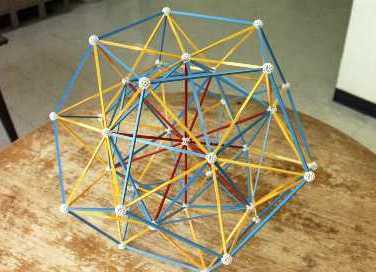 Notice that the entire model lies interior to a large dodecahedron with blue edges. Stage IV. 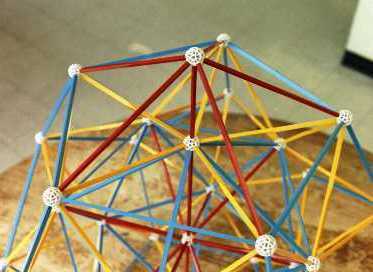 Here you must add a layer of 60 tetrahedra to those present. This requires 12 R2 struts, 60 R3 struts, and 12 balls. 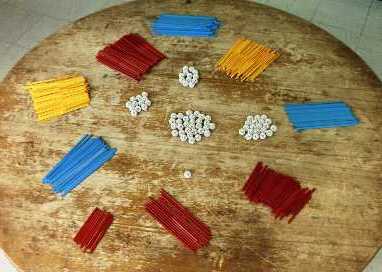 Using 1 R2 strut, 5 R3 struts, and one ball, build a "rosette" as shown here. You need a total of 12 of these. Mount a rosette on one of the pentagons constructed in stage III. 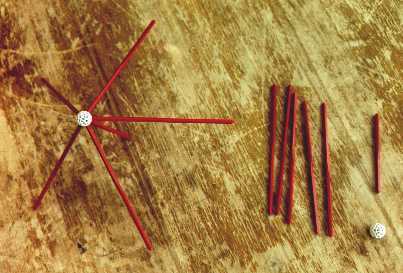 Mounting each rosette, you must attach a total of 6 red struts, five R3 at the vertices of a pentagon and one R2 in the middle. 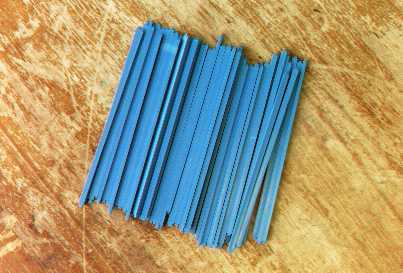 Mount the remaining rosettes. This is how the model appears when stage IV is completed. 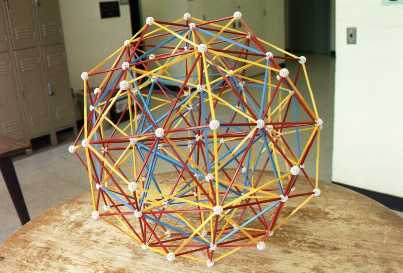 Now the model is inscribed in an object known as the "rhombic triacontahedron". This non-regular polyhedron is comprised of 30 red rhombi. Stage V. Here you must add a layer of 60 tetrahedra to those present. This requires 60 R2 struts, 60 Y3 struts, and 30 balls. Using 2 R2 struts, 2 Y3 struts, and one ball, build a squat pyramid figure, as shown in the figure. You must build a total of 30 of these. Mount a squat pyramid on one of the rhombi from stage IV. Mount the remaining squat pyramids. This is how the model appears after stage V is completed. Stage VI. 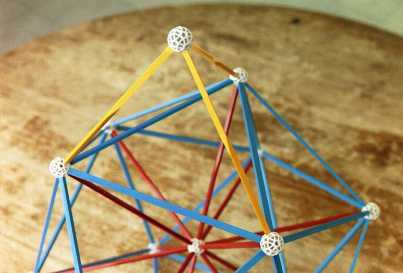 The last stage is to adjoin another 60+20=80 tetrahedra. Nearly all of the edges of these tetrahedra are already present, so one merely has to complete them by attaching 60 B3 struts. 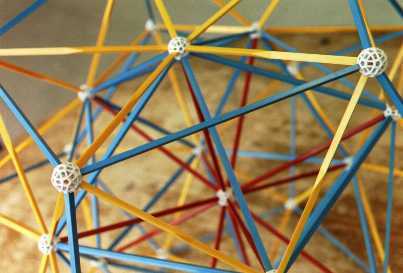 If you have been counting carefully, you might have noticed that you constructed only 270 solid tetrahedra, despite the fact that this model represents a "600-cell". One can explain this disparity in the numbers after remembering that this model more accurately represents a projection of the 600-cell into three-dimensional space. Each of the solid tetrahedra should be counted twice, for the preimage of each tetrahedron under the projection consists of two tetrahedra. This yields 540 tetrahedra, so there are still another 60 which appear to be missing. 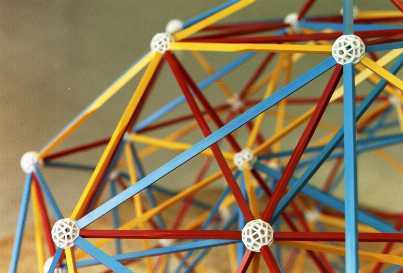 These 60 tetrahedra appear on the outer layer of the model. 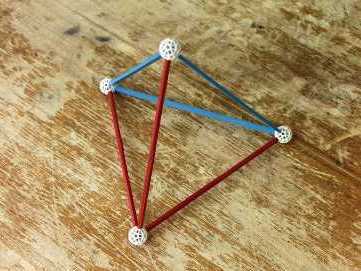 Each is represented by an isoceles triangle with 2 Y3 struts and 1 B3 strut. The reason these don't have as many edges as a tetrahedron is that the projection completely flattens them. After understanding that all 600 tetrahedra are represented somehow, one should also check that all 120 vertices, all 720 edges, and all 1200 triangular faces are also present in some form. Be careful because a few of the edges are projected to single points and many triangles are projected to line segments. Choosing an edge at random, one should be able to find a total of 5 tetrahedra and 5 triangles sharing that edge. Finally, emanating from each vertex are 12 edges, 30 triangles, and 20 tetrahedra. 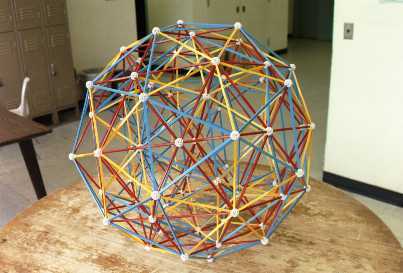 The "vertex figure" for the 600-cell, therefore, is a regular icosahedron.